Fatmat vs Kilmat vs Noico vs Dynamat / The Sound Deadening FACTS! Blog Fatmat vs Kilmat vs Noico vs Dynamat / The Sound Deadening FACTS! Is the noise from your vehicle’s engine ruining your cruise? Do you want to enjoy your sound system better? Or do you just want the inside of your ride to be a haven of blissful silence? There are loads of soundproofing solutions out there that can provide the sort of results you are looking for. The question is, which vehicle sound deadener is the best? Fatmat, Kilmat, Noico or Dynamat? This is a tricky question that we hope to help you answer by the end of this article. And to do that, we’ll be looking at some of the best soundproofing mats on the market, namely Fatmat, Kilmat, Noico, and Dynamat. While it’s true that with any of these soundproofing options, you can better enjoy the sound quality of your car stereo, have conversations while driving with fewer interruptions from the outside world, and just simply enjoy your vehicle better, picking the best vehicle sound deadener is key to getting the best results at the best price. How to Pick Best Soundproofing Material Between Noico, FatMat, Dynamat, and Killmat? So which is better between Fatmat, Noico, Dynamat, and Kilmat? So here’s all the information you need to know about Fatmat, Noico, Kilmat, and Dynamat to help you make the right choice. Noico can be best described as an 80 mils thick, butyl and foil soundproofing material. It’s great at what it does and comes with the extra benefit of being affordable. So is Noico your best choice? Let’s find out more. Noico’s sound deadening material can be purchased as either a 50 mils thick option or an 80 mils thick option. Naturally, the 80 mils thick variant makes for a better purchase if your goal is quality soundproofing and it’s actually worth it as it is just 25% more expensive than the 50 mils. Noico is designed to be lightweight so you can install it in any part of your car or even all parts of it without overly affecting the overall weight of your vehicle. Also, even though reasonably light, the material is still dense enough to deliver top sound insulation. In each package of Noico 80 mil, you get enough material to cover 36 square feet in the form of a stack of nine sheets. Compared to many other noise blocking mats, especially Dynamat, Noico is very affordable and yet still offers quality soundproofing results. This makes it a very popular option among consumers who’d like to save money without compromising on quality. At 80 mils thick, it’s denser than Dynamat and several other soundproofing mats. This makes it highly efficient at providing sound insulation. Even though it’s bulky at 80 mils, Noico mats are surprisingly lightweight at about 0.7lbs for every square foot. Available in multiple sheets, precisely nine sheets which makes installing it in various parts of your vehicle possible. If you don’t want the Noico material with the foil top layer because you think its look will ruin aesthetics, Noico offers you the alternative of an all-black version of its material. This alternative is called merely Noico Black Car Sound Deadening. Noico mats can be installed anywhere you please, and that includes rooms in your home where you believe silence is golden. But the material does its best work in an automobile by eliminating general noise and more. For a better picture of if Noico sound deadeners are for you, here are some primary pros and cons of the product. Roller for installation is not included. 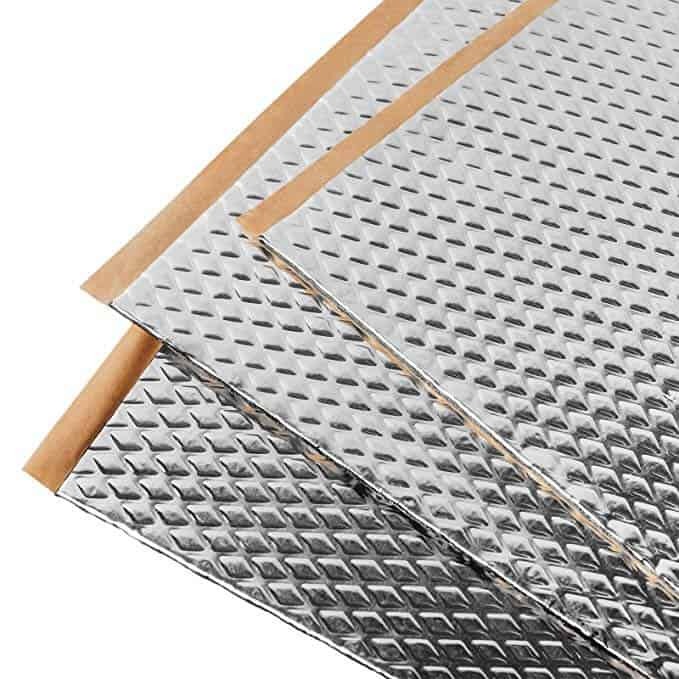 Overall, Noico sound deadening mats are suitable for soundproofing vehicle roofs, doors, trunks, and other parts. While the rubbery smell is something to consider, its affordable price and soundproofing performance make it a worth it buy. Click here for the current Noico price from Amazon. Kilmat is another sound deadener made with butyl that’s available in 80 mils thickness. And would you believe it? It’s actually cheaper than Noico! It is also self-adhesive and weighs about 0.5 lbs per square foot, making it not only cheaper but also lighter than Noico. But is Kilmat better than Noico? Like Noico mats, Kilmat materials come with a special indicator that will warn you if the product is not properly installed. This ensures you get the best results from the installed product. In the Kilmat package, you will find the material in 34 handy size sheets that make cutting and installing easy for all, regardless of the size of the space to be covered. There’s enough material in one package to cover 36 square feet. The affordability of Kilmat makes it one of the most purchased soundproofing mats on the market. But it’s not just its affordability that makes this product attractive as it also offers better soundproofing than many of its more expensive counterparts. Another point in favor of the product is not only is it an effective noise insulator, but it’s also an effective heat insulator. This is a double win that will serve car owners well when driving in winter. The product features a universal material that ensures the material can be installed anywhere outdoors or indoors as a sound insulator. You can install it inside a vehicle or outside on the hood or wheel well. Kilmat doesn’t stink of rubber or have any other offensive odor. Even the adhesive used to stick it on is odorless. The adhesive on the Kilmat material is designed to stick fast and last long. The adhesive is already on the mat, so this makes installation quick and easy. Sound insulation and heat insulation rolled into one product to give you a less noisy and cozier ride. Each sheet of Kilmat sound deadener mat is of a manageable size that makes handling and installing it more comfortable. There are a total of 34 sheets in the pack. Still not sure if Kilmat is the right product for you? These pros and cons will help you make up your mind. The sheets are relatively stiff which can slow down the installation process. While the Kilmat 80 mil is not as popular as Noico’s, it’s definitely a great product. And since you will be getting all the benefits of a Noico product at a lesser price and minus the odor, the Kilmat sound deadener makes for a better alternative. Click here for the current KilMat price from Amazon. Dynamat is possibly the most popular brand of sound deadener on this list. Custom builders have been using the product for years and have been recommending it to their clients for a quieter and more comfortable ride. But is it all talk from a big brand or has Dynamat earned its status? Dynamat’s products are the go-to solution for many vehicle owners looking to keep noises and vibration in their vehicle to the barest minimum. The product comes highly recommended for its sound insulation efficiency which exceeds that of most other products on the market. Dynamat’s sound deadeners are highly versatile and are suitable for installation both within and outside a vehicle. In fact, they can even be installed in homes and offices to enhance sound insulation. When installed in the interior of a vehicle, this 50 mils thick material will significantly cut down vibrations and road noise. It is available in made to measure packs which means installation can be easily accomplished anywhere and on any surface with ease. But installing the Dynamat does require a bit of patience and expertise. That said, if properly installed, you can look forward to long-lasting and top quality sound insulation. Most of the complications during installation come from the material being quite dense, which makes it difficult to fold into certain spaces. As earlier stated, while Dynamat is great for reducing noise and vibrations in vehicles, it is also suitable for installation in other places where you’d like to minimize noise. For instance, you are more than welcome to install Dynamat to soundproof your study or nursery. You can even use it to soundproof your home theater. Where and how you use the product is entirely up to you and your noise reduction goals. But because Dynamat isn’t cheap, using it to soundproof a large space can prove to be quite pricey. So how much exactly does Dynamat cost and is it worth it? This is a very good question especially if you are considering Dynamat as an alternative to the less pricey options of Noico and Kilmat. Before we talk about the actual price of Dynamat, it’s important to note that top quality usually costs top dollar. By that reasoning, Dynamat offers a great quality product at a good value. Where Kilmat will cost you $1.65 per square foot, Dynamat will cost you about $5 per square foot. That’s a big price difference that comes along with a promise of guaranteed performance. To determine if Dynamat truly delivers good value for cash, let’s take a look at some of its biggest pros and cons. Can get a sample to test its effectiveness before buying a package. A separate roller has to be purchased for installation. If you intend on soundproofing a large vehicle or room with Dynamat, it’s going to cost you far more than using Noico or Kilmat. Dynamat’s popularity is earned from its status as a top quality product that delivers impressive results. The price is high, and you might like that, but the amount of effort it takes to install this product may be considered by some to be a turnoff. Either way, Dynamat delivers reliable soundproofing, which is what is most important. Just be prepared to pay extra for its brand name and market proven quality. Click here for the current Dynamat price from Amazon. The most important things you need to know about FatMat sound deadener upfront is that it’s thicker than Dynamat but less expensive, and as thick as Kilmat but more costly. Although, it is cheaper than Noico. With its 80 mils thickness and lower price, FatMat makes for a worthy alternative to Dynamat. It’s also versatile enough to handle a variety of demanding jobs. What truly differentiates FatMat from Noico, Kilmat and Dynamat are what it’s made of. Unlike the other three, FatMat uses an asphalt-based material to block out annoying and irritating sounds. This isn’t necessarily a good thing as asphalt as certain features that make it less effective than a butyl-based sound deadener. Nonetheless, Fatmat makes for a fairly priced soundproofing alternative and its 80 mils thick material comes in 18-inch wide rolls. The material can be easily cut into suitable sizes to fit your specific installation needs. It can be installed on dashboards, in trunks, on door panels, floors, and any other area of a vehicle where you’d like to minimize noise. Regarding effectiveness, FatMat works well for sound isolation and boosting sound quality within the room it is installed. But the fact that the material is asphalt-based comes with some downsides. Chief of which is asphalt doesn’t do well in high temperatures. Unlike Dynamat which is heat resistant, FatMat’s asphalt-based material conducts heat and can turn the interior of a vehicle blistering during hot weather. This makes FatMat more suitable for people who live in colder regions. Also, even though it’s thicker than Dynamat, its noise cancelation capabilities are not as impressive. On the upside, the product is easier to install when compared to Dynamat. 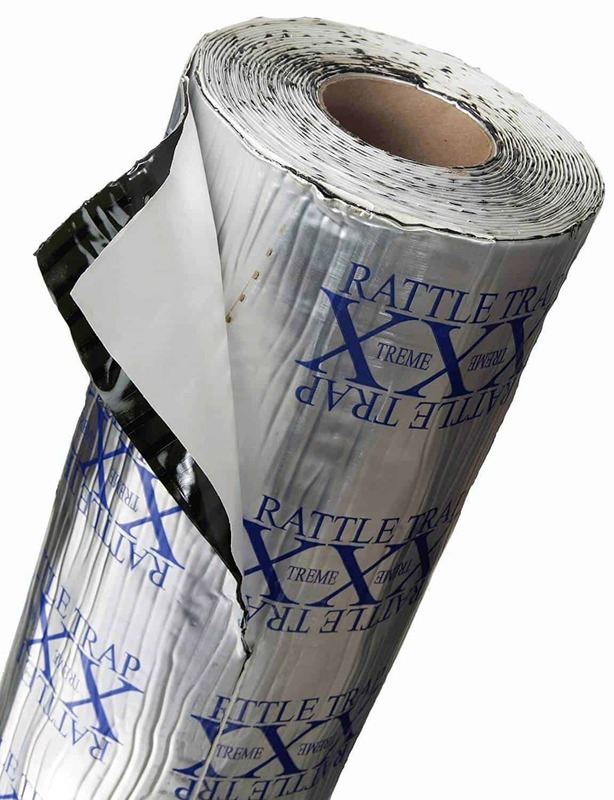 Unlike Dynamat, FatMat is self-adhesive which makes applying and installing it more straightforward. But because if its asphalt base, the mat can be hard to install unless the heating temperature is just right. One also needs to make sure that the material doesn’t adhere to any other surface but the one that it is to be applied to, including itself. This is because once FatMat sticks, getting it to unstick is almost impossible. To help you decide if FatMat is the right choice for you, here are some of its major pros and cons. The material can be ordered to specifications. This way, you don’t have to order for any more than you need. FatMat is pretty much the middle child among all the other sound deadeners we’ve already mentioned – It’s not the most expensive, neither is it the cheapest. It’s not the best in regards to overall quality, but it still gets the job done. So before we give our final verdict concerning which of the four soundproofing materials actually makes for the best buy, let’s pause to take a look at what factors must be considered to pick the best sound deadening material for your needs. Click here for the current FatMat price from Amazon. Naturally, what counts as the best soundproofing option for your needs will depend greatly on your preference, budget and soundproofing goals. Let’s delve deeper into this by looking at the factors that should guide every soundproofing material purchase. When buying soundproofing material, you can opt for either a sound blocker or a sound absorber. A sound blocker keeps out sound while a sound absorber softens sound within a space. Knowing what type of effect you are trying to achieve will help you determine if what you need is a sound absorber or blocker. Good news is, Noico, Kilmat, Dynamat and FatMat serve as both sound absorbers and blockers. So regardless of which product you go for, your needs will still be met. Oil and lubrication is key to the performance of any vehicle. Thus, you will need a sound deadening material that doesn’t respond negatively to oil. Be sure to opt for a soundproofing material that can adhere to surfaces effectively regardless of if that surface is oil stained or not. You might think that a heavier material is better because it will be denser, but this isn’t necessarily true. In fact, a lightweight sound deadening material will actually be preferable for a variety of reasons. One of the said reasons is that it will be less tasking to install and is also more likely to stick to and remain on the surface it is attached to. Regarding flexibility, the more flexible the material is, the better. This is because soundproofing material with greater flexibility will be easier to manipulate and install in tight corners and on irregular surfaces. The composition of the sound deadening material will go a long way in determining its effectiveness and durability. For instance, butyl-based materials are lightweight and dense enough to be effectively soundproof. The material is also heat resistant and flexible. On the other hand, asphalt-based materials are good at soundproofing but have the downside of not being heat resistant, are less flexible, and can have an undesirable odor. This shows that knowing the material type and its features will help you determine not only if the product will serve your desired purpose but will also satisfy all your other specifications. Durability is key to being able to enjoy an installed sound deadener for as long as possible. The more durable the product is, the longer it will last and perform optimally after installation. The thicker the material is, the better. This is because the thickness or the density of a sound deadening product determines its ability to block and absorb sound and vibrations. The denser a material is, the more effective it will be at soundproofing. Purchasing soundproofing material is one thing while installing it is something else entirely. The faster and easier it is to install, the sooner you can begin enjoying its benefits. Look out for a material that is self-adhesive and whose installation process is uncomplicated. The fewer the steps in the installation process, the better. This ties in with installation difficulty. If the material sheets are too large, installing them in a car can be difficult, especially since you have to cut the material first. And if the material sheet is too small, it can take a lot of time installing it piece by piece on a large surface. To get a material that’s of the right size, first consider the surface it will be installed on and if there are uneven areas. This will help you determine if large or smaller sheets will make for a faster and more effective installation. The best way to decide if a product is right for you is to try it for yourself. But to help you bypass the costs of trial and error, we’ve tried the Fatmat, Noico, Dynamat, and Kilmat sound deadening mats for you and here’s what we think about which is better. In the case of Dynamat vs FatMat vs Noico vs Kilmat, FatMat comes out as the least when it comes to overall performance. But let’s take a look at other points of comparison. Price-wise, Dynamat is the most expensive, costing as much as $150 for a pack. Noico and Kilmat are the least expensive costing about $66 and $56 respectively. This makes Kilmat the most affordable among the four options. This doesn’t mean that Dynamat is a bad option simply because it is the most expensive. After all, it is touted as one of the best sound deadeners on the market, and if you can afford it, you can buy it. But Kilmat and Noico due to their cost-effectiveness and individual quality can both serve as less expensive alternatives that still get the job done. The cost-effectiveness of Kilmat and Noico also make them especially good options if you have a large soundproofing project in mind. But if you want the absolute cheapest option that still delivers great value, Kilmat is the way to go. Regarding thickness/density, Noico, Fatmat, and Kilmat are all 80 mils thick, unlike Dynamat which is 50 to 60 mils thick. As you already know, when it comes to soundproofing the thicker the better. Dynamat’s 50 mils thickness is above average when you look at other products in the market, but this doesn’t really give it an upper hand in this particular contest. This makes Dynamat the loser in terms of thickness and Noico, Fatmat and Kilmat equal. Because of the higher 80 mils thickness of Noico, Fatmat, and Kilmat, all three can be expected to perform anywhere between 20% and 50% better as sound deadeners. In terms of effectiveness and reliability, FatMat is probably the least reliable. While it has a strong adhesive that ensures the sound deadening mat will be stuck to whatever surface you attach it for a very long time, the product’s asphalt-based material is its downfall. Asphalt-based materials just aren’t as effective as butyl-based materials. Also, FatMat’s material tends to leave an odor and isn’t heat resistant, which can make it problematic during hot seasons. This brings us to Noico and Kilmat which are both butyl-based products but it seems that Kilmat takes the upper hand because Noico has an asphalt underlay. This leads to certain issues such as Noico’s odor and reduced heat resistance. 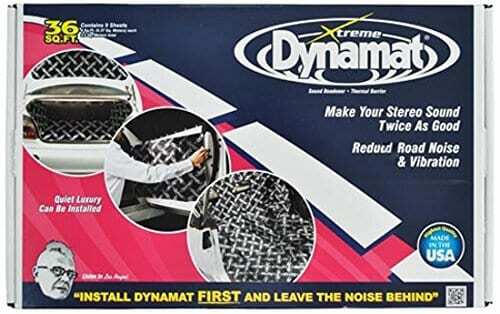 Dynamat, on the other hand, is already regarded by the market to be fully reliable and effective at sound deadening. The product is very popular and has millions of users that attest to its quality and reliability. It is also butyl based. That said, Kilmat and Noico are both great at their job and will definitely make a cheaper and just as effective alternative for Dynamat. Especially Kilmat because it is odorless and doesn’t have an undercoating of asphalt like Noico. While price and effectiveness are definitely important, how easy the product is to install is also very important. After all, a difficult to install product will cost you more time and might even need an expert to get the job done. Hiring an expert for installation will add to the cost of installing the product. Dynamat might be a more established brand that’s considered highly effective by many, but that doesn’t change the fact that the product can be quite tricky to install. Installation difficulty is especially high if installing Dynamat for the first time with no prior experience installing soundproofing. This leads to many customers incurring the extra cost of having a professional install it on their behalf. That said, if you watch a tutorial video or two on YouTube before you get started, you’ll find the installation process easier as you progress with the process. As for FatMat, installation can be also tricky due to its extremely strong adhesive that is unforgiving of mistakes. Once the adhesive sticks to a surface, removing the material becomes almost impossible and can complicate installation. Noico and Kilmat, on the other hand, are easier to install than the aforementioned two because they are lightweight and very flexible. 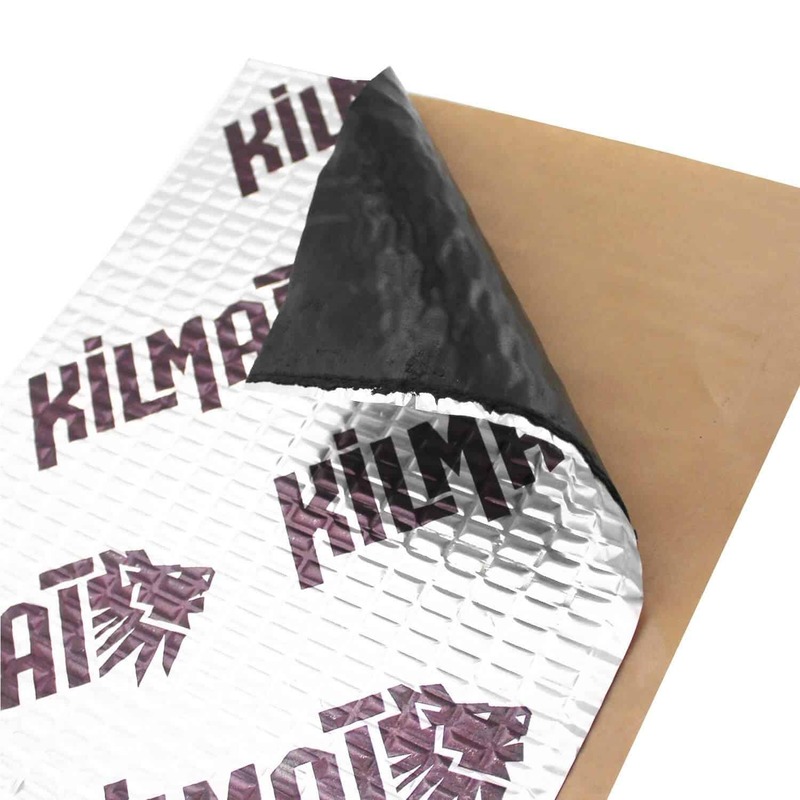 Especially Killmat because of its smaller sheets which make for easy handling. Even beginners with no experience can have an easy time installing either one of these two. They also require no additional kit to complete installation, making Noico and Kilmat both winners for ease of installation and use. To select a winner, it is important to avoid going for a product simply because it is the cheapest available option. Going for the most expensive with the mindset that it will be the best is also not your best move. Because each product comes with its own list of unique shortcomings and features, opt for the option that offers more of the features you need and shortcomings that you are willing to live with. That said, all the products discussed in this article will all serve well as quality sound deadeners that will minimize noise and vibrations. But if you are looking for a quality product and want to save money, then Kilmat makes for a great choice that offers the right balance of features. But if what you want is a product that is more publicly recognized and has more satisfied customer reviews, and are willing to pay the price, then Dynamat might be just what you are looking for.